The various species cover a vast area, occurring through Africa, the Indian Subcontinent, to China, Ryukyu Islands in southern Japan, down Southeast Asia to Thailand, Brunei, Indonesia, the Philippines, New Guinea, Australia and islands of the Indian Ocean, and the South China Sea. The West Nile monitor is now found in South Florida and in Singapore. Monitor lizards are almost entirely carnivorous, consuming prey as varied as insects, crustaceans, arachnids, myriapods, mollusks, fish, amphibians, reptiles, birds, and mammals. Most species feed on invertebrates as juveniles and shift to feeding on vertebrates as adults. Deer make up about 50% of the diet of adults of the largest species, Varanus komodoensis. In contrast, three arboreal species from the Philippines, Varanus bitatawa, Varanus mabitang, and Varanus olivaceus, are primarily fruit eaters. Although normally solitary, groups as large as 25 individual monitor lizards are common in ecosystems that have limited water resources. The genus Varanus is considered unique among animals in that its members are relatively morphologically conservative and yet show a range in size that is equivalent to a mouse and an elephant. Finer morphological features such as the shape of the skull and limbs do vary though, and are strongly related to the ecology of each species. Monitor lizards maintain large territories and employ active pursuit hunting techniques that are reminiscent of similar sized mammals. The active nature of monitor lizards has led to numerous studies on the metabolic capacities of these lizards. The general consensus is that monitor lizards have the highest standard metabolic rates of all extant reptiles. Monitor lizards have a high aerobic scope that is afforded, in part, by their heart anatomy. Whereas most reptiles are considered to have three chambered hearts, the hearts of monitor lizards — as with those of boas and pythons — have a well developed ventricular septum that completely separates the pulmonary and systemic sides of the circulatory system during systole. This allows monitor lizards to create mammalian-equivalent pressure differentials between the pulmonary and systemic circuits, which in turn ensures that oxygenated blood is quickly distributed to the body without also flooding the lungs with high pressure blood. Anatomical and molecular studies indicate that all varanids (and possibly all lizards) are partially venomous. Monitor lizards are oviparous, laying from 7 to 37 eggs, which they often cover with soil or protect in a hollow tree stump. Some monitor lizards, including the Komodo dragon, are capable of parthenogenesis. The family Varanidae probably originated in Asia at least 65 million years ago, although some estimates are as early as the late Mesozoic (112 million years ago). Monitor lizards probably expanded their geographic range into Africa between 49 and 33 million years ago, possibly via Iran, and to Australia and the Indonesian archipelago between 39 and 26 million years ago. Varanids last shared a common ancestor with their closest living relatives, earless "monitors", during the Late Cretaceous. During the Late Cretaceous era, monitor lizards or their close relatives are believed to have evolved into amphibious and then fully marine forms, the mosasaurs, some of which reached lengths of 12 m (39 ft) or more. Snakes were believed to be more closely related to monitor lizards than any other type of extant reptile; however, it has been more recently proposed that snakes are the sister group of the clade of iguanians and anguimorphs. Like snakes, monitor lizards have forked tongues which they use to sense odors. 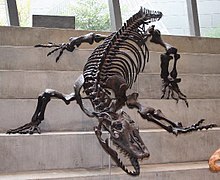 During the Pleistocene epoch, giant monitor lizards lived in Southeast Asia and Australasia, the best known fossil being the megalania (Varanus priscus, a giant goanna formally known as Megalania prisca). This species is an iconic member of the Pleistocene megafauna of Australia, thought to have survived up until around 50,000 years ago. The generic name Varanus is derived from the Arabic word waral/waran ورن/ورل, from a common Semitic root ouran, waran, or waral, meaning "dragon" or "lizard beast". In English, they are known as "monitors" or "monitor lizards". The earlier term "monitory lizard" became rare by about 1920. The name may have been suggested by the occasional habit of varanids to stand on their two hind legs and to appear to "monitor", or perhaps from their supposed habit of "warning persons of the approach of venomous animals". In Austronesia, where varanids are common, they are known under a large number of local names. They are usually known as biawak (Malay and Indonesian), bayawak (Filipino), binjawak or minjawak (Javanese), or variations thereof. Other names include hokai (Solomon Islands), bwo or puo (Maluku), halo (Cebu), galuf or kaluf (Micronesia and the Caroline Islands), batua or butaan (Luzon), alu (Bali), hora or ghora (Komodo group of islands), phut (Burmese) and guibang (Manobo). In South Asia, they are known as hangkok in Meitei, udumbu in Tamil and Malayalam, goih (गोहि) in Maithili, ghorpad घोरपड in Marathi, uda in Kannada, in Sinhalese as kabaragoya, in Telugu as udumu, in Punjabi and Magahi (and other Bihari languages) as गोह (goh), in Assamese as gui xaap, and in Odia as ଗୋଧି (godhi), and in Bengali as গোসাপ (goshaap) or গুইসাপ (guishaap) and गोह (goh) in Hindi. Due to confusion with the large New World lizards of the family Iguanidae, the lizards became known as "goannas" in Australia. Similarly, in South African English they are referred to as leguaans, or likkewaans, from the Dutch term for the Iguanidae, leguanen. Some species of varanid lizards can count: studies feeding V. albigularis varying numbers of snails showed that they can distinguish numbers up to six. V. niloticus lizards have been observed to cooperate when foraging: one varanid lures the female crocodile away from her nest, while the other opens the nest to feed on the eggs. The decoy then returns to also feed on the eggs. Komodo dragons, V. komodoensis, at the National Zoo in Washington, D.C., recognize their keepers and seem to have distinct personalities. Monitor lizards have become a staple in the reptile pet trade. The most commonly kept monitors are the savannah monitor and Ackies monitor, due to their relatively small size, low cost, and relatively calm dispositions with regular handling. Among others, black-throated monitors, timor monitors, Asian water monitors, Nile monitors, mangrove monitors, emerald tree monitors, black tree monitors, roughneck monitors, dumeril's monitors, peach-throated monitors, crocodile monitors and Argus monitors have been kept in captivity. Monitor lizard meat, particularly the tongue and liver, is eaten in parts of India and Malaysia as an alleged aphrodisiac. In parts of Pakistan and southern India, different parts of monitor lizards are used for a variety of medical purposes. The flesh is eaten for the relief of rheumatic pain, abdominal fat is used as a salve for skin infections, oil and fat are used to treat hemorrhoids or chronic pain, and the oil is used as an aphrodisiac lubricant (sande ka tel). 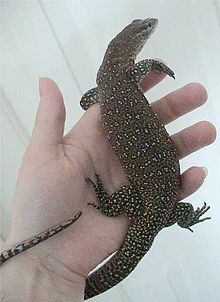 "Large scale exploitation" of monitor lizards is undertaken for their skins, which are described as being "of considerable utility" in the leather industry. In Papua New Guinea, monitor lizard leather is used for membranes in traditional drums (called kundu) , and these lizards are referred to as "kundu palai" or "drum lizard" in Tok Pisin, the main PNG trade language. The meat of monitor lizards is eaten by some tribes in India, Thailand, Australia and in West Africa as a supplemental meat source. The meat of monitor lizards is used in Nepal for medicinal and food purpose. The skin of monitor lizards is used in making a carnatic music percussion instrument called a kanjira. According to IUCN Red List of threatened species, most of the Monitor lizards species fall in the categories of least concern but the population is decreasing globally. All but five species of monitor lizard are classified by the Convention on International Trade in Endangered Species of Wild Fauna and Flora under Appendix II, which is loosely defined as species that are not necessarily threatened with extinction, but may become so unless trade in such species is subject to strict regulation order to avoid use incompatible with the survival of the species in the wild. The remaining five species – V. bengalensis, V. flavescens, V. griseus, V. komodoensis, and V. nebulosus – are classified under CITES Appendix I, which outlaws international commercial trade in the species. The Yellow Monitor, Varanus flavescens is protected in all range countries except Bhutan; Nepal, India, Pakistan and Bangladesh. In Tamil Nadu and all other parts of South India, catching or killing of monitor lizards is banned under the Protected Species Act. ^ Bauer, Aaron M. (1998). Cogger, H.G. ; Zweifel, R.G. (eds.). Encyclopedia of Reptiles and Amphibians. San Diego: Academic Press. pp. 157–159. ISBN 0-12-178560-2. ^ Greene, Harry W. (1986). Diet and Arboreality in the Emerald Monitor, Varanus Prasinus, with Comments on the Study of Adaptation. Chicago: Field Museum of Natural History. OCLC 14915452. Retrieved 12 December 2013. ^ Welton, L. J.; Siler, C. D.; Bennett, D.; Diesmos, A.; Duya, M. R.; Dugay, R.; Rico, E. L. B.; Van Weerd, M.; Brown, R. M. (2010). "A spectacular new Philippine monitor lizard reveals a hidden biogeographic boundary and a novel flagship species for conservation". Biology Letters. 6 (5): 654–658. doi:10.1098/rsbl.2010.0119. PMC 2936141. PMID 20375042. ^ Pianka, E.R. (1995). "Evolution of Body Size: Varanid Lizards as a Model System" (PDF). The American Naturalist. 146 (3): 398–414. doi:10.1086/285806. ^ McCurry, Matthew R.; Mahony, Michael; Clausen, Phillip D.; Quayle, Michelle R.; Walmsley, Christopher W.; Jessop, Tim S.; Wroe, Stephen; Richards, Heather; McHenry, Colin R. (2015). "The Relationship between Cranial Structure, Biomechanical Performance and Ecological Diversity in Varanoid Lizards". PLoS ONE. 10 (6): e0130625. doi:10.1371/journal.pone.0130625. PMC 4479569. PMID 26106889. ^ King, D., Green, B., Knight, F. (1999). Monitors: The Biology of Varanid Lizards. Florida. Krieger Publishing Company. ^ a b c Pianka, E.R., Vitt, L.J. (2003). Lizards: Windows to the Evolution of Diversity. California. University of California Press. ^ Smith, Kerri. "Dragon virgin births startle zoo keepers". Nature. Retrieved 2006-12-20. ^ Zheng, Yuchi; Wiens, John J. (2016). "Combining phylogenomic and supermatrix approaches, and a time-calibrated phylogeny for squamate reptiles (lizards and snakes) based on 52 genes and 4162 species". Molecular Phylogenetics and Evolution. 94: 537–547. doi:10.1016/j.ympev.2015.10.009. ^ Schulte, JA; Melville, J; Larson, A (2003). "Molecular phylogenetic evidence for ancient divergence of lizard taxa on either side of Wallace's Line". Proceedings of the Royal Society B: Biological Sciences. 270: 597–603. doi:10.1098/rspb.2002.2272. PMC 1691285. PMID 12769459. ^ Vidal, N; Marin, J; Sassi, J; Battistuzzi, FU; Donnellan, S; Fitch, AJ; Fry, BG; Vonk, FJ; Rodriguez de la Vega, RC; Couloux, A; Hedges, SB (2012). "Molecular evidence for an Asian origin of monitor lizards followed by Tertiary dispersals to Africa and Australasia". Biology Letters. 8: 853–855. doi:10.1098/rsbl.2012.0460. PMC 3441001. ^ "Monitor Lizards". BBC Nature. BBC. Retrieved 2014-03-05. ^ Price, Gilbert J.; Louys, Julien; Cramb, Jonathan; Feng, Yue-xing; Zhao, Jian-xin; Hocknull, Scott A.; Webb, Gregory E.; Nguyen, Ai Duc; Joannes-Boyau, Renaud (2015-10-01). "Temporal overlap of humans and giant lizards (Varanidae; Squamata) in Pleistocene Australia". Quaternary Science Reviews. 125: 98–105. doi:10.1016/j.quascirev.2015.08.013. ^ a b c d Robert George Sprackland (1992). Giant lizards. Neptune, NJ: T.F.H. Publications. p. 61. ISBN 0-86622-634-6. ^ a b King, Dennis & Green, Brian. 1999. Goannas: The Biology of Varanid Lizards. University of New South Wales Press. ISBN 0-86840-456-X, p. 43. ^ a b c Pianka, E.R. ; King, D.R. and King, R.A. (2004). Varanoid Lizards of the World. Indiana University Press. ^ Parameswaran, K (2006). "Case series of eosinophilic meningoencephalitis from South India". Annals of Indian Academy of Neurology. 9 (4): 217–222. doi:10.4103/0972-2327.29203. ^ a b Hashmi, M. Usman Ali; Khan, M. Zaheer; Amtyaz; Huda, Nawaz Ul. "Current Status, Distribution and Threats of Varanus Species (Varanus bengalensis & Varanus griseus) in Karachi & Thatta of Sindh" (PDF). International Journal of Fauna and Biological Studies. AkiNik Publications. 1 (1): 34–38. ISSN 2347-2677. Retrieved 12 December 2013. ^ "Meats We Also Eat". The Telegraph India. 2017-01-08. Retrieved 2018-08-12. ^ "Identification Guides for Wildlife Traded in Southeast Asia". ASEAN-WEN. 2008. ^ Ziegler, Thomas; Schmitz, Andreas; Koch, Andre; Böhme, Wolfgang (2007). "A review of the subgenus Euprepiosaurus of Varanus (Squamata: Varanidae): morphological and molecular phylogeny, distribution and zoogeography, with an identification key for the members of the V. indicus and the V. prasimus species groups". Zootaxa 1472: 1-28. ^ Weijola, Valter; Sweet, Samuel (2010). "A new melanistic species of monitor lizard (Reptilia: Squamata: Varanidae) from Sanana Island, Indonesia" (PDF). Zootaxa. 2434: 17–32. ^ Eidenmüller, Bernd; Wicker, Rudolf (2005). "Eine weitere neue Waranart aus dem Varanus prasinus-Komplex von den Insel Misol, Indonesian ". Sauria 27 (1): 3-8. (Varanus reisingeri, new species). (in German). ^ Weijola, Valter; Donnellan, Stephen; Lindqvist, Christer (2016). "A new blue-tailed Monitor lizard (Reptilia, Squamata, Varanus) of the Varanus indicus group from Mussau Island, Papua New Guinea". ZooKeys. 568 (568): 129–54. doi:10.3897/zookeys.568.6872. PMC 4829673. PMID 27103877. ^ Koch, André; Gaulke, Maren; Böhme, Wolfgang (2010). "Unravelling the underestimated diversity of Philippine water monitor Lizards (Squamata: Varanus salvator complex), with description of two new species and a new subspecies". Zootaxa 2446: 1-54. (Varanus rasmusseni, new species, p. 28). ^ "Varanus (Soterosaurus) rasmusseni ". The Reptile Database. www.reptile-database.org. Merrem B (1820). Versuchs eines Systems der Amphibien: Tentamen Systematis Amphibiorum. Marburg: J.C. Krieger. xv + 191 pp. + one plate. (Varanus, new genus, p. 58). (in German and Latin). Wikimedia Commons has media related to Varanidae.